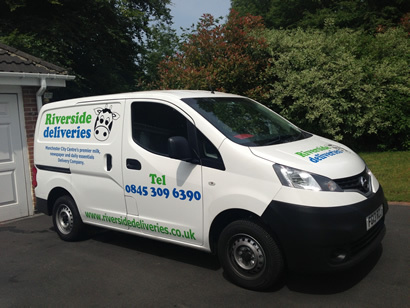 We have been providing a daily delivery service to businesses and offices throughout central Manchester for over 20 years, and our service is second to none. We understand that all businesses in the current climate are keen to save on costs wherever they can so we guarantee to beat any like for like quote. In addition to our regular deliveries of milk and papers, we also offer free next day delivery of tea, coffee, sugar, biscuits, mineral water, fresh orange juice and many more office essential items all at fantastic prices, so why not browse through our website and see what we offer. If there is anything you require but is not listed or you prefer a different brand to the ones shown please do not hesitate to contact us and we will be only too happy to assist. We also provide administrative savings to your business with consolidated monthly invoices. We promise to beat any like for like quote and provide the best value, freshest produce possible. We also promise to have your order with you before your first cuppa and guarantee delivery by 9am.